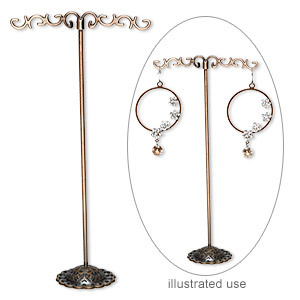 NEW - Display, earring, antique copper-finished steel, 11 x 9-1/2 x 4 inches with curves. Sold individually. 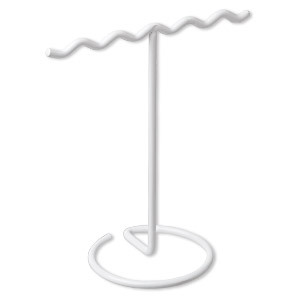 Display, earring, powder-coated steel and "pewter" (zinc-based alloy), 6-1/4 x 3 x 1-1/4 inches. Sold per pkg of 2. 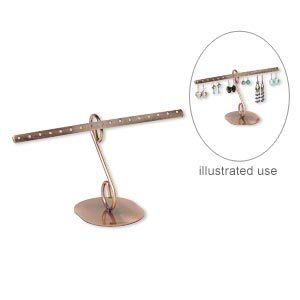 Display, earring, antique copper-finished steel and "pewter" (zinc-based alloy), 6-1/4 x 3 x 1-1/4 inches. Sold per pkg of 2. 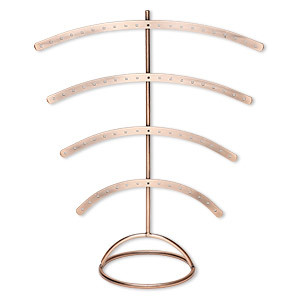 Display, antique copper-finished steel, 8 x 4-1/2 x 3-1/2 inch bar. Sold individually. 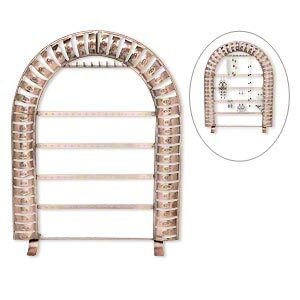 Display, necklace and earring, antique copper-finished steel, 14 x 12 x 4-inch arch with rectangles and 8 hooks, holds 36 pairs. Sold individually. 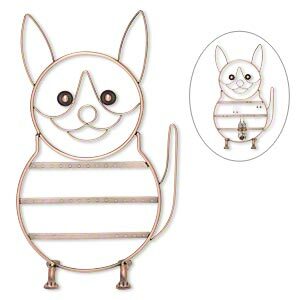 Display, earring, antique copper-finished steel, 14-1/2 x 8-1/2 x 4-inch dog, holds 20 pairs. Sold individually. 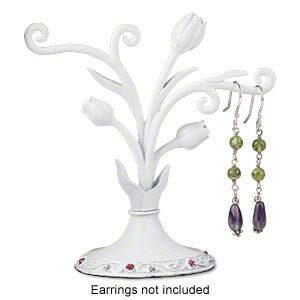 Display, "pewter" (zinc-based alloy) and enamel, lavender, 4-1/2 x 5 x 2 inch tree with butterflies. Sold individually. 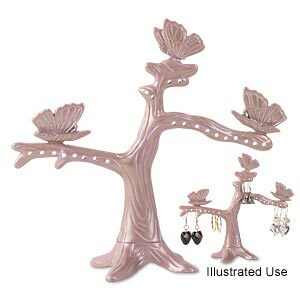 Display, "pewter" (zinc-based alloy) and glass rhinestones, white / pink / clear, 4 x 4 x 2-1/4 inch 3-rose design. Sold individually. 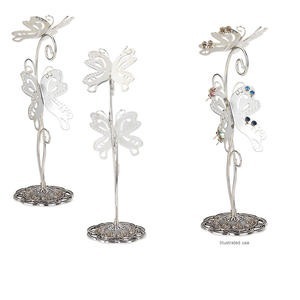 Display, silver-finished steel and antiqued silver-finished "pewter" (zinc-based alloy), 9 x 2-1/2 x 3 inch double butterfly. Sold individually. 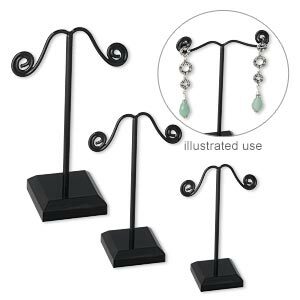 Display, 2-tier, steel / antiqued "pewter" (zinc-based alloy) /glass rhinestone, cream and clear, 8-1/4 x 8-x 2-3/4 inches, holds 14 pairs. Sold individually. 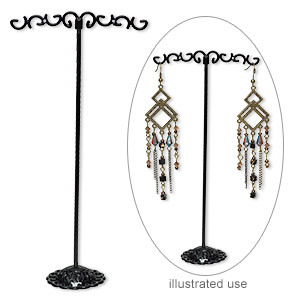 Display, earring, acrylic and black-plated steel, black, 3-1/3 x 2-1/3 x 1-1/8 inches / 4-1/4 x 2-1/3 x 1-1/3 inches / 4-3/4 x 2-1/3 x 1-1/2 inches. Sold per pkg of 3. 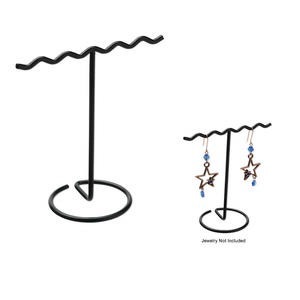 Display, earring, steel and vinyl, black, 4x4 inches. Sold per pkg of 4. 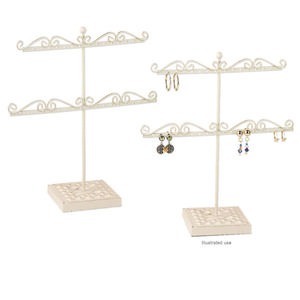 Display, earring, steel and vinyl, white, 4 x 3-3/4 x 2 inches. Sold per pkg of 4. 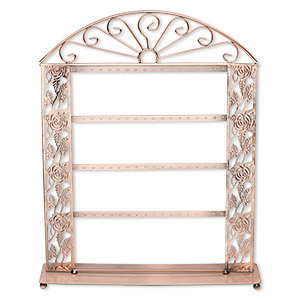 Display, earring, antique copper-finished steel, 15 x 12 x 3-inch rectangle with roses, holds 36 pairs. Sold individually.